Auto sort image files by date taken. Auto sort video files by date taken. When you run PhotoMove 2 this is the screen you will see. Choose the folder that contains the files you want to check. Choose a new location where the sorted folders holding your files will be made. Let PhotoMove find all the files that contain exif information with the actual date your photos were taken or your videos were recorded. 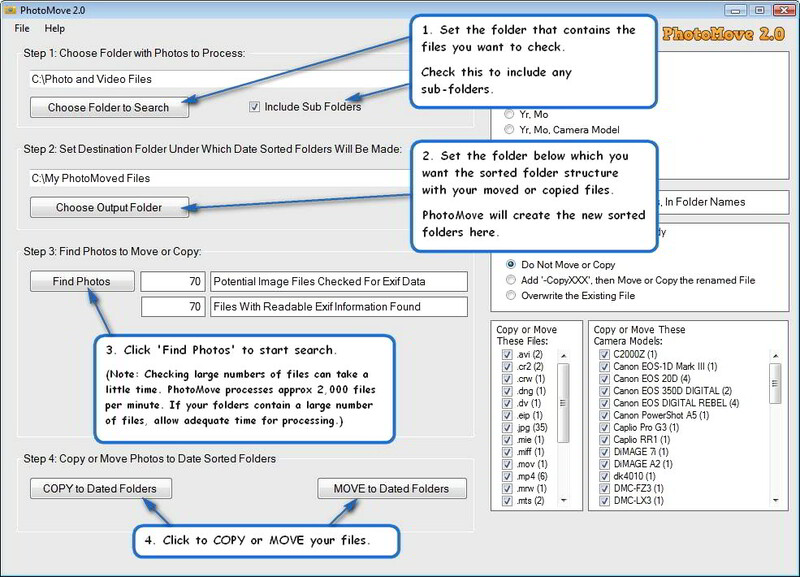 Click either the COPY or MOVE button to process your files. You’ll find your photo or video files in dated subfolders under the destination folder you set sorted by the date taken. What a wonderful timesaver. I Love It! Great Work! I´d like to thank you for developing such a simple and useful tool for organizing my big mess of files. What a great tool for managing all my photos/images. Easy to use, lightweight, intuitive and several options. A handy additional feature to add would be to permit changing of the file create/modified date based on the EXIF taken date. Thank you again. An invaluable “must-have” tool in my workflow. I use PhotoMove 2.5 Pro to organize all the media I capture from a myriad devices into folders based on the date captured for further processing. Before PhotoMove I was using scripts and manual steps to organize files for my requirements and it was a headache frankly. PhotoMove has saved me a lot of time. I can’t thank you enough for this amazingly helpful and easy to use tool! Keep up the fabulous work. Wow!! This software is great. Does what it says and sorts out the pics without a fuss. Have been waiting along for this. Now my pics are all well organised. Thank you. WOW .. let me say that again .. WOW !!! I just started on the almost impossible project of cataloging my images, one 1 NAS alone there were over 115k JPG, RAW and MPEG files that were basically all over the place! After a great deal of hours moving the files from one storage center directory to another, all my images and video files are in a perfect file structure! Year, Date, Day and Camera organization done painlessly and automatically! I can’t thank the creators of this system enough, they have done what I feared having to do relatively painless! One word of caution, don’t use the MOVE command unless you’ve tried it on a small directory to make sure you have the options you desire setup, I missed a setting and found a number of files were not setup by camera which is extremely important to me since I often shoot the same event with several camera bodies, in any event it wasn’t a show stopper but it’s something to be aware of. Very good photo organising tool! I was searching for such a “simple”tool for a long time. Organising my photo’s is much easier right now! Thanks! I can proudly say it’s the best money spend on a modern day application. Must have for people that need help with organizing their photo/video library. Thank you for this application! Great software. Just what I was looking for. I was using Pixella which was bundled with my wife’s camcorder. Pixella doesn’t run under Win8. So I needed a new editor… I decided upon Cyberlink which I had used before. My problem of copying video clips over and keeping track of dates was still an issue. This is where your software came into play. Does exactly what I need. The free version did everything I need but heck for $8 … I’d gladly pay for software that does what it says it does. No muss… no fuss. Sorry for the long explanation! Keep up the good work.